Sicily’s known for its cuisine, its Greek ruins, and its beautiful landscapes. As a large island, it has also has many beaches, some of which are spectacular. Quite a few others are, if not spectacular, certainly good. 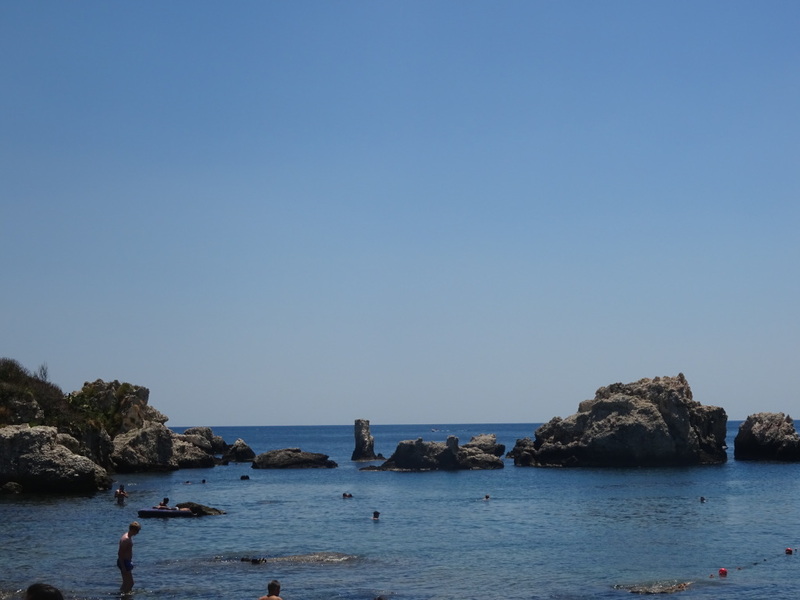 I’m not a great swimmer, but I love to swim outdoors and snorkel, and swimming in the ocean was one of the main reasons I went to Sicily for a few weeks in July. The beach at Isola Bella, near Taormina in Sicily. 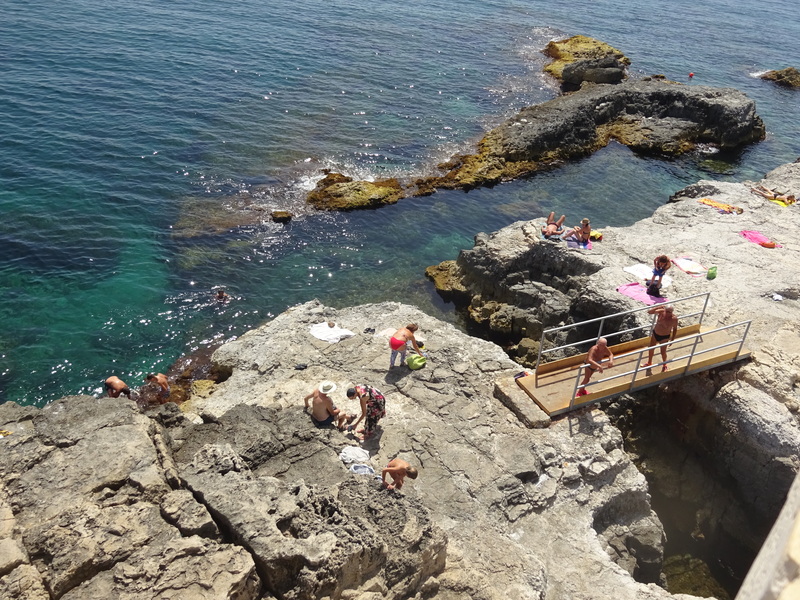 Even three weeks or so isn’t nearly enough time to sample everywhere worth swimming in Sicily. But we did manage to hit quite a few spots considering our limited time. Even the five we visited were pretty different from each other, but all are worth a dip should you make it over. There are many reasons to visit Palermo, the capital of Sicily, including its architecture and lively streetlife. Beaches are not at the top of the list, nor close to the city center, but you might find yourself dying to cool off if you visit when the temperatures are nearing 100 degrees Fahrenheit, as we did. It’s a pretty short bus ride to Mondello beach a few miles outside the city. 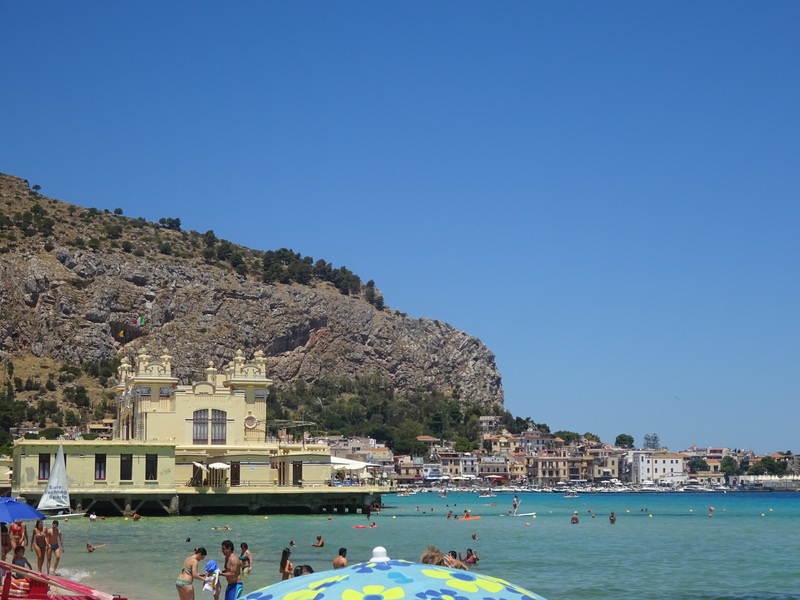 Mondello beach, looking to the west. 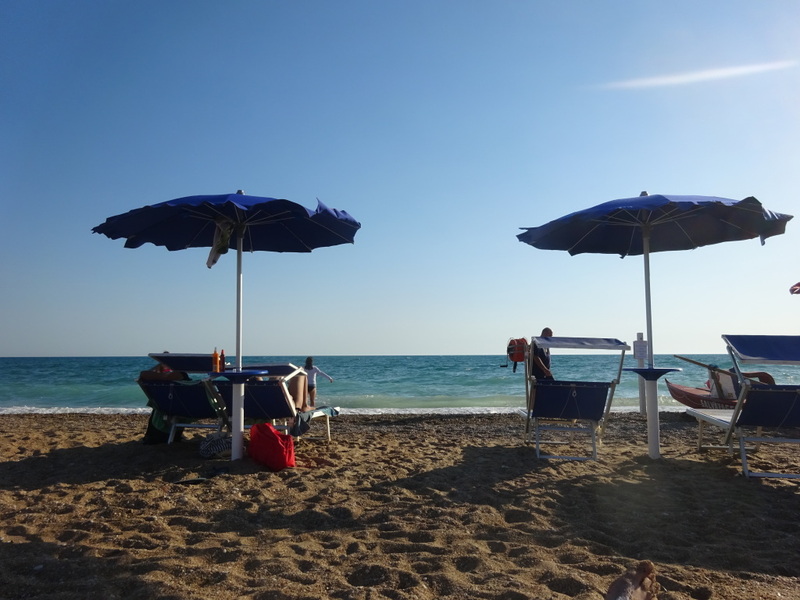 As with most beaches we visited, there are areas where visitors can plant themselves for free, and others where you’ll need to pay a fee for an umbrella and deck chair. Unless you’re traveling with a beach umbrella, it’s often worth it to spring for the paid spots, elitism be damned. The Mediterranean sun can be pretty searing — certainly more so than summer sun in California and New Jersey, the two states where I’ve done most of my ocean swimming in the US. 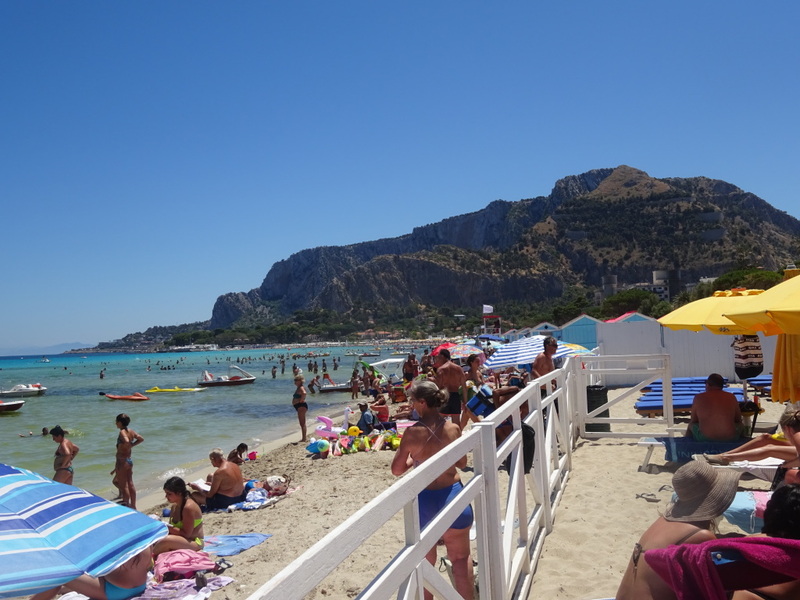 Mondello beach, looking to the east. Agrigento is most famed for its Greek ruins, and we were lucky enough to also get caught up in a huge holiday parade and fireworks during our stay. South of Palermo and even hotter, you might again feel the need to cool off in the beach, even on a Sunday when few buses are running and little info on their departure stops and times is available. 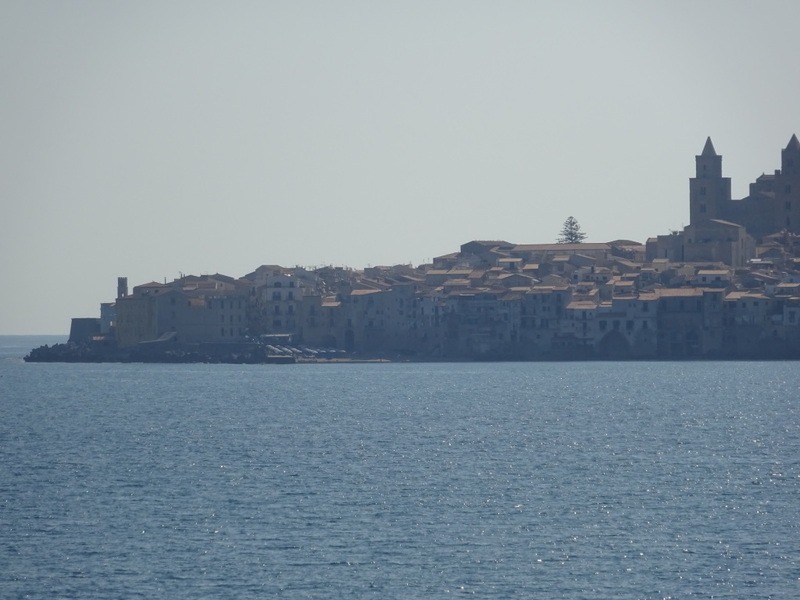 Nonetheless we managed to catch one to San Leone, just a few miles outside town, not long before sundown. The manager of the umbrella/deck chair operation we patronized took pity on us and charged us about one-third of the going rate. It was quite a bargain for an hour or so of swimming in much choppier, more churning waters than Mondello. The beach is pretty narrow and stony, so you’re going more for the ocean than the lounging here. The beach at San Leone. Even if you enter by stairs (which are only installed in the summer months), this site might not be for the more casual swimmer. The water gets pretty deep pretty quickly just feet from shore, and some parts are quite rocky, especially the narrow channel connecting different parts of the swimming area. 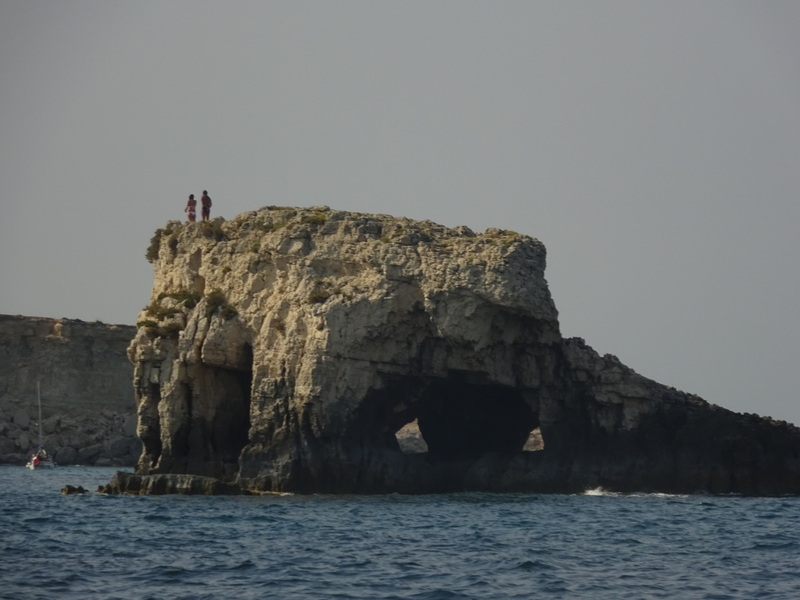 Even wearing beach shoes in the water, I got a few cuts bumping my knees and thighs against the irregularly spaced and shaped rock formations under the surface. Most of the swimmers here and at other beaches-with-rocks we visited nonetheless swam barefoot. Their heartiness is admirable, but I’d really advise considering taking along a hardy pair of beach shoes to wear while you’re actually swimming in the water if you don’t want to come home limping, or worse. It’s no time to be macho (in a crowd where many women and girls, I hasten to note, were swimming barefoot) if you’re not feeling like a local expert in navigating the rocks. My traveling partner is a much better swimmer than I am, and even she couldn’t avoid a hip bruise. I got my efficient beach shoes for less than $50 at REI, and those or equivalents shouldn’t be hard to track down before you visit. 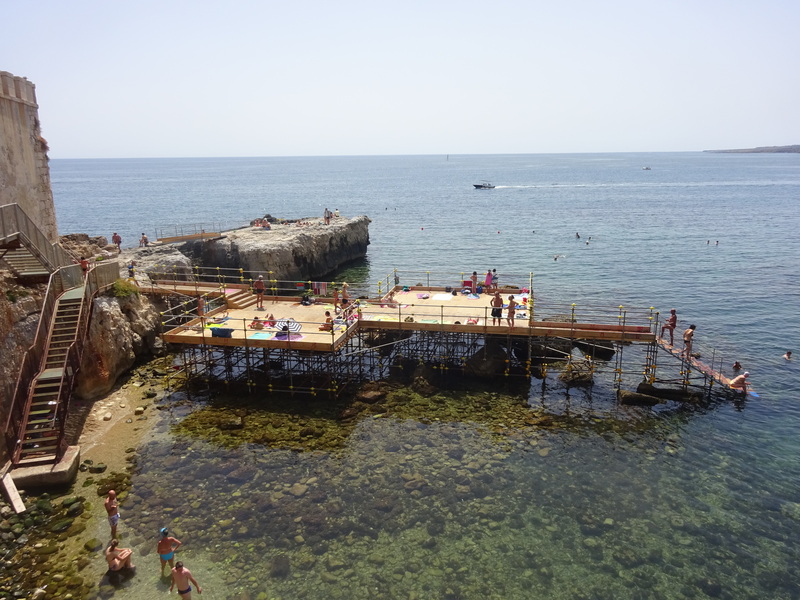 Overview of the rockiest parts of the Solarium beach in Ortigia, in Siracusa. On the same ride we passed by the rock below, off which people were jumping or diving into the sea (I can assure you I am not one of the divers in this picture). The captain of our small craft took this opportunity to swim to the rock and execute an impressive flip/dive into the water, nonchalantly swimmng back to the boat to pilot us back to Ortigia. 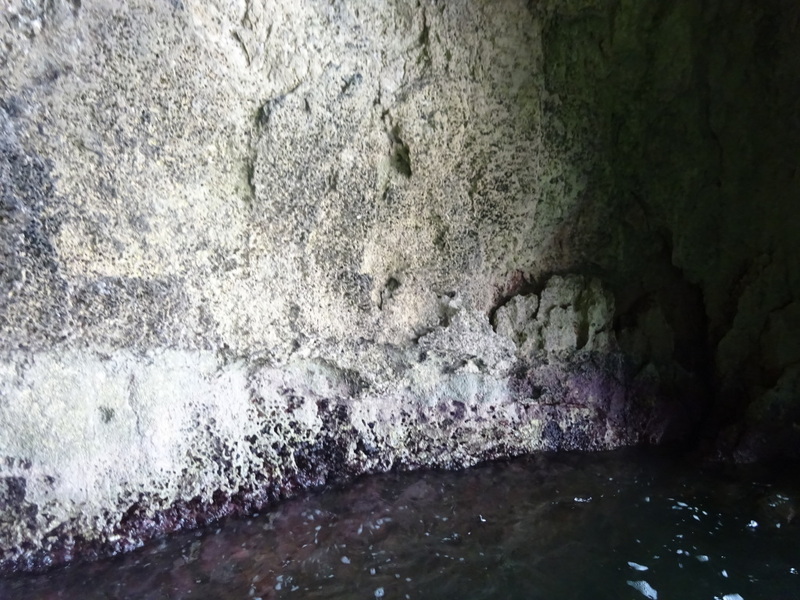 We were supposed to have a few minutes to swim in the grotto too, but the company selling the trip didn’t inform the boat crew, who were recruited spur of the moment after the original boatman didn’t make it. If you’ve seen Monty Python’s The Meaning of Life, you’ll remember the scene where Eric Idle, playing a European waiter, leads us on a long walk through heavy traffic to the meaning of life, all the while intimating that it’s just around the corner. That’s how we felt when the young woman from the tour company led us to the boat, telling us all the while, “just two more minutes” before we ended up at a tourist office where we were asked if we could wait another hour. We couldn’t, so a substitute was hastily arranged, but apparently not informed that a grotto swim was part of the deal. Maybe next time. 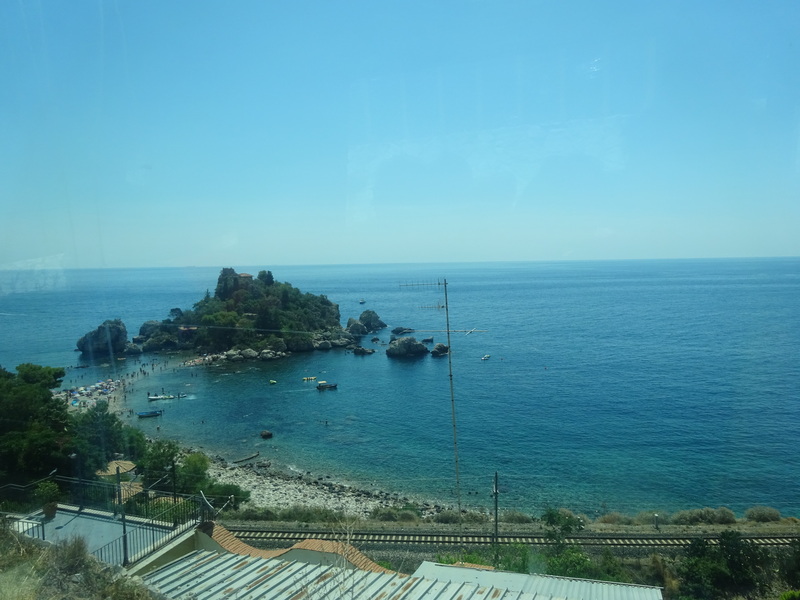 Isola Bella, viewed on a bus ride down from Taormina. Rocks to which we swam at Isola Bella. That does mean you’ll never be alone on Isola Bella in the summer, and one day it was so crowded we couldn’t even rent one of the 20-Euro-per person umbrella-deck chair deals. But it’s worth putting up with and then some, and once you get in the water, there’s space enough and more, especially as it’s not hard to get several hundred meters from shore in calm and safe conditions. 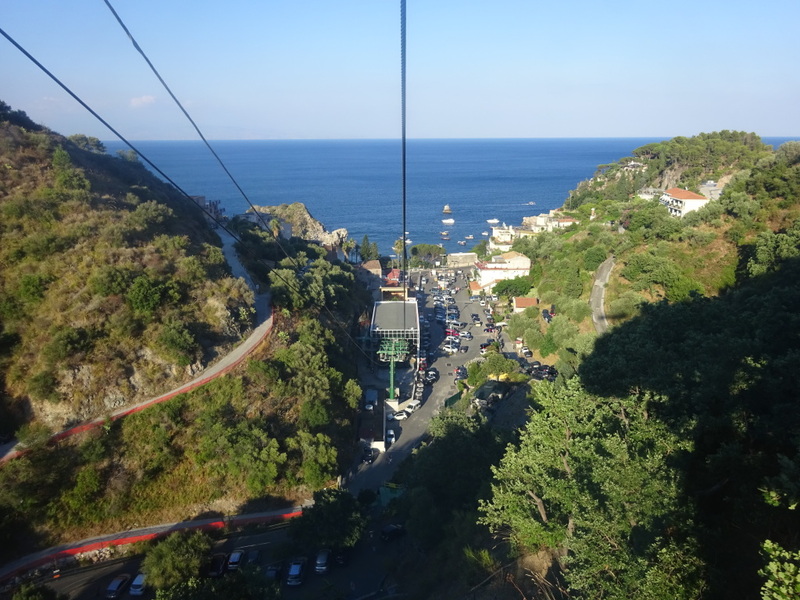 You can also get a bit more breathing room by walking around Isola Bella itself, though there’s a small (four-Euro) fee for that, and much of the island remains off-limits to visitors. The swimming’s quite different from Isola Bella, or Siracusa. In those places, you really need to swim, not wade, if you get more than a few feet from shore, so deep does it get so fast. 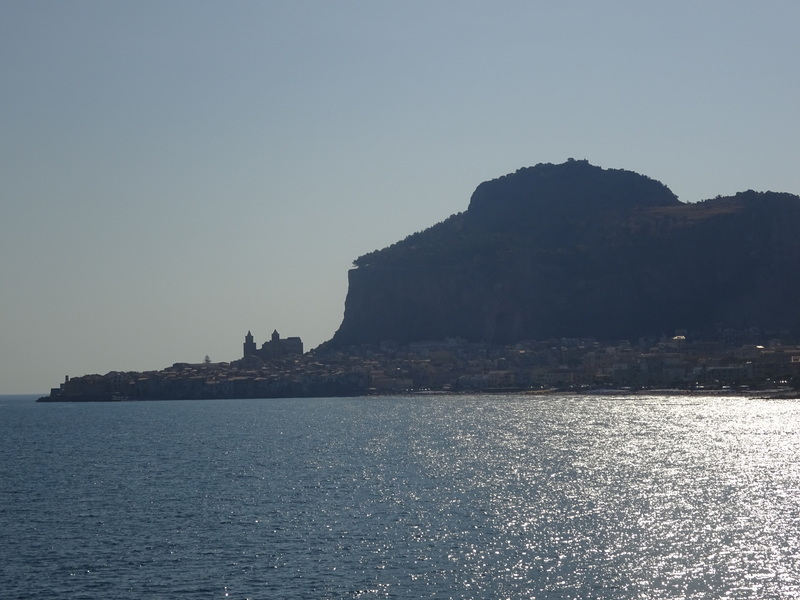 In Cefalu, it’s almost impossible to get out far enough to where your feet won’t hit the sand. And for most of the beach, it is smooth sand in the water — smooth enough that you won’t need those beach shoes. 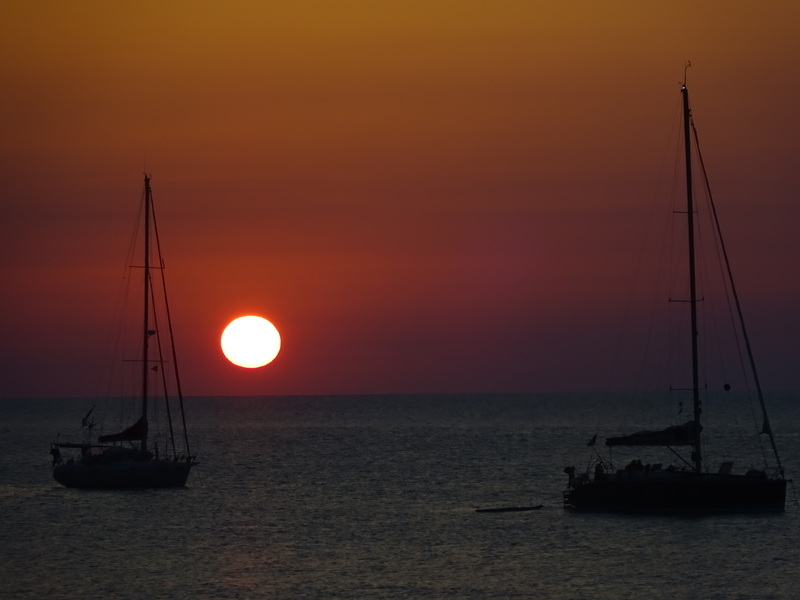 Sunset as viewed from the beach in Cefalu.